This inspiring Southeast Asia river cruise takes you to Vietnam, Cambodia, and Thailand. You’ll be immersed in the cultures and ancient traditions as you sightsee and spend time with locals in the most fascinating places along the mighty Mekong River. The best way to experience Vietnamese culture is with a tour of its fascinating capital of Hanoi. Go on a cyclo ride through the ancient streets of the Old Quarter and enjoy a water puppet performance. Travel through the peaceful countryside to Ha Long Bay where you’ll cruise by its breathtaking limestone islands. 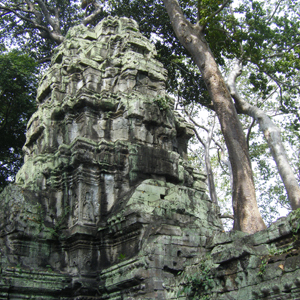 In Siem Reap, Cambodia, see the phenomenal Temples of Angkor with an intricacy and architectural grandeur unmatched in the world. Enjoy an inspiring Aspara dance performance before embarking on your river cruise. In the capital of Cambodia, Phnom Penh, tour the National Museum and Royal Palace with its striking Silver Pagoda. On a hilltop at the site of the 8th-century temple of Wat Hanchey, take in the stunning views before walking through the rural village of Angkor Ban to visit with welcoming schoolchildren. Continue your Southeast Asia cruise into Vietnam and visit a colorful market, the home of a local family making handcrafted sampans, and a workshop to learn how rice wine and traditional candies are made. In Ho Chi Minh City, see the famous landmarks and try your hand in the kitchen-Vietnamese-style, with a cooking class. On an excursion to the Cu Chi Tunnels, walk through a section of the immense underground tunnel system used during the Vietnam War. Your adventure ends in Bangkok, where you’ll visit its most renowned temples, including the Temple of the Reclining Buddha-the oldest and largest of its kind. The perfect way to conclude this unforgettable river cruise vacation! Fishing, golf and, of course, elephant kraals. Established in 1767 as the capital of Thailand the city maintains a timeless charm. An extensive system of canals has earned it the nickname “Venice of the Far East,” and visitors should make a point of experiencing its floating marketplace. Bangkok is of course also world-renowned for its wealth of ancient temples and beautiful gardens–and did we mention, shopper’s paradise. An hour from Laem Chabang is Pattaya, Thailand’s most popular vacation spot. That’s where the elephant kraals come in. Smaller, quieter, greener and more dignified than Ho Chi Minh City, the nation’s capital can sometimes look like a provincial French city. This, like most things in Vietnam, is changing fast as economic restrictions are lifted and old regulations are forgotten. Life (and traffic, unfortunately) is returning to the streets and shopping no longer means a trip to a dreary government department store. Still, the city remains quiet enough for cycling to be the ideal means of getting around, and many hotels and cafes rent bicycles. Places to visit include the fascinating 11th-century Temple of Literature (site of Vietnam’s first University), the 15th-century Old Quarter, some enchanting lakes and temples, and the Mausoleum of Ho Chi Minh. Budget accommodation can be scarce in Hanoi, especially between June and September, but many people rent rooms and with some searching you should find something. Whatever your budget, you’ll pay more for accommodation in Hanoi than elsewhere in the country. Hanoi has plenty of domestic and international air connections, and is connected with Ho Chi Minh City by the Reunification Express train.